One of the breakout video games of the mid-1980s is back on the Mac, in all of its original glory. 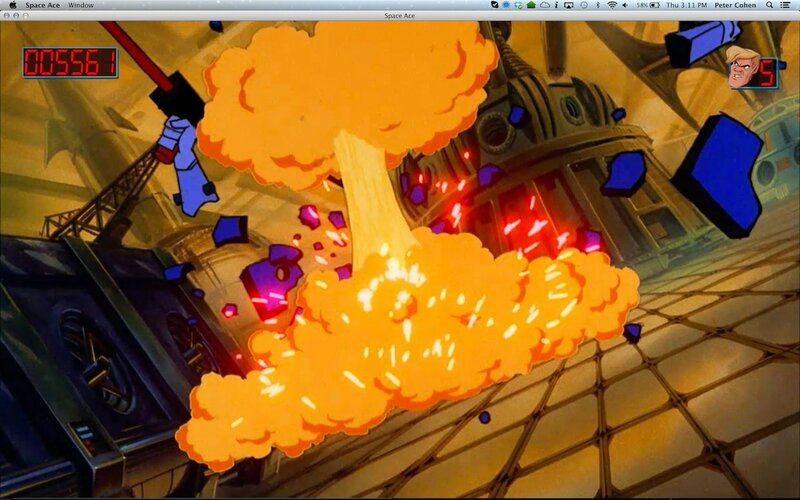 Space Ace, the game featuring cel animation created by former Disney animator Don Bluth, is now available for download from the Mac App Store. If you're a child of the 80s, it's a fun trip down memory lane. For the uninitated: Back in the 1980s, we went to arcades to play the latest video games. We'd while away our time playing our favorites, jamming quarters into coin slots for a few brief minutes of fun. We also wore parachute pants and skinny leather ties and listened to music on Walkman cassette players. It was another era. I had hair back then. Most games of the early to mid 80s varied between blotchy, blocky sprite-based graphics and sharp-lined vector graphics, but computing power was very limited, and thus so was graphics rendering capabilities. 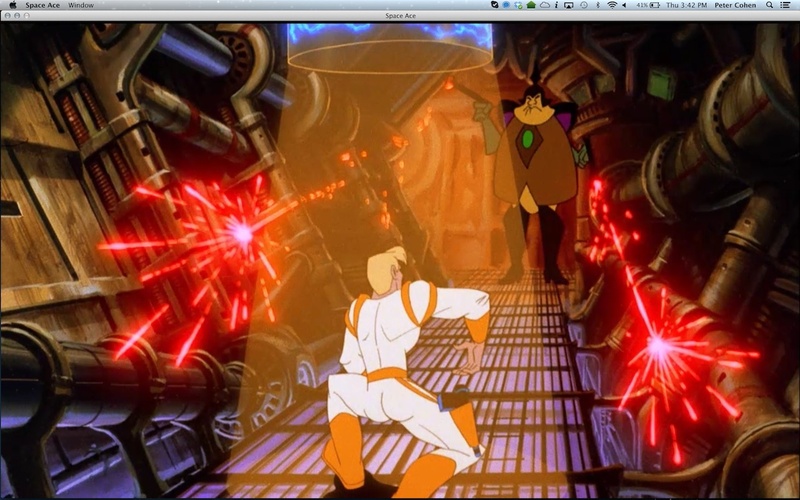 Cinematronics introduced Dragon's Lair in 1983, and rewrote the rules. The game used real cel-drawn animation created by Don Bluth, stored on laserdisc. It was quickly succeeded by another Bluth-made game called Space Ace. Space Ace is the blond, lantern-jawed defender of truth, justice and the planet Earth. The evil blue-skinned alien Borf hits Ace with a weapon called the Infanto-ray, which reduces the strapping Ace to his gawky teenage form, Dexter. Borf then kidnaps Ace's girlfriend Kimberly, and Ace/Dexter has to rescue her and defeat Borf. To help Ace/Dexter achieve his goals, you need to direct him to move and take action at key moments during animated sequences. Make the wrong move and Ace might fall to his doom, get zapped by a laser beam or crash his spaceship into a wall. Make the right move and be rewarded with a few more seconds of animation before another key sequence appears and you have to do the same all over again. It's a unique gameplay experience, because you can't arbitrarily move Ace in any direction - you have to follow a rigid set of commands, executed at precisely the right time, in order to win. That requires both good reflexes and good memory skills. There are a few branching choices you can make, but Space Ace isn't the sort of game that lends itself to being replayed a lot. After each death, you're knocked back to the beginning of a scene or sequence, and that gets irritating fast. Fortunately, you have unlimited continues, so you can pick up where you left off, and a saved game feature lets you continue the game at a later point (but it doesn't let you save multiple game files). The pacing is vicious - you barely have a moment to catch your breath before you have to execute another move. Just like the coin-op arcade version, Space Ace sports three difficulty settings, which truncate content from the game rather than adjust any inherent gameplay difficulty (kind of difficult to do so when everything is so heavily scripted). The only way to play through the entire unabridged game is to play on Ace mode. Settings allow you to adjust how much help you'll get in the game - it can guide you with arrows to make the correct move, and cues beeps to let you know when to act - and there's also a full screen setting that doesn't quite work - my menu bar was still visible. Extras with the game include the "Attract" mode that the original arcade game used to get players to try it out, the ability to watch the game all the way through, a high score table and a tutorial. Space Ace doesn't hold up to today's games in terms of actual gameplay, but it's a piece of nostalgia bound to tickle the fancy of gamers of a certain age. It's been faithfully recreated on the Mac, but it's probably more of a museum piece than it is something that you'll want to play over and over again.